Is there an Optimal Final Height for the plant? Most everything I read says to continue the Vegetative Stage until the plant is about 1/2 its desired height, then flip to Flowering Stage, because plants about double in height on average. Assuming you are keeping the canopy as flat as possible. Should you try for as tall as your tent/light will allow without burn? Or is there an optimal height found to give best yield/quality? Does the plant waste energy moving the nutrients up a taller plant? 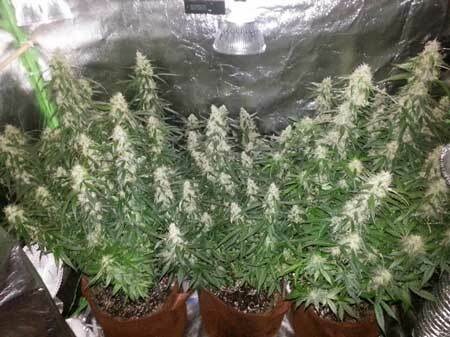 I see amazing pictures of bountiful plants that appear to be under 36", with lots of fat dense colas. When it comes to training cannabis plants indoors, in the best-case scenario, you want your plants to be big enough to support as much bud as your grow light can produce. Yet there's no point in having a whole bunch of bud sites located below where the light can reach, because buds that don't get any light usually do not fatten up. 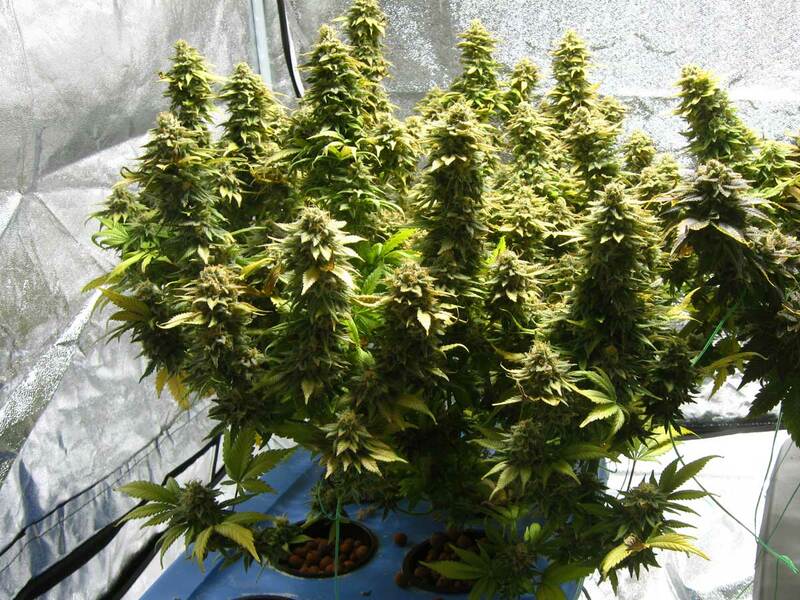 So, when growing indoors the optimal length of buds is heavily dependent on your grow light. Optimal Plant Height Depends on Your Grow Light. 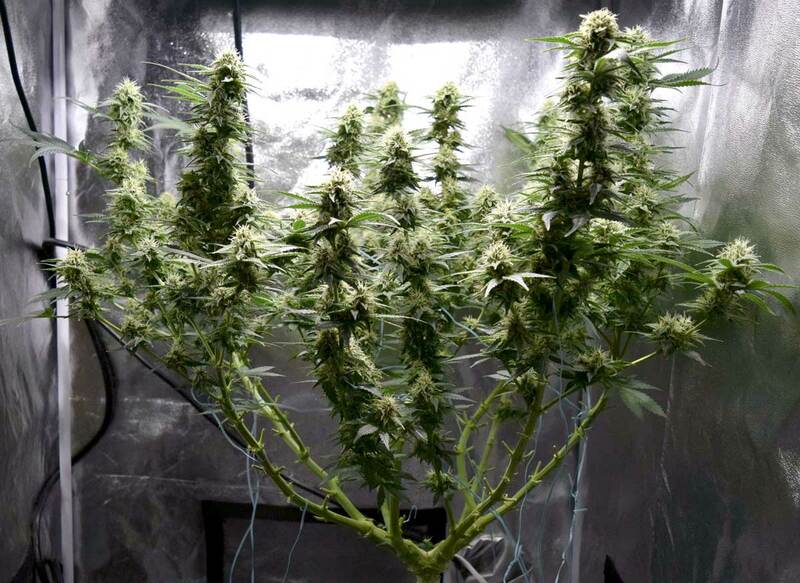 Bigger Lights Can Support Bigger Plants and Longer Buds! If you examine the structure of an indoor cannabis plant at harvest, you'll often see that there's long fat "colas" at the top, and underneath there are smaller buds. The further down you get on the plant, the smaller the buds are. After a certain point, the buds are so small that they don't really add any significant weight. Big buds form on top, but as you get further from the light, the buds get smaller until there are almost none. If these plants had been allowed to get any taller (with everything else the same), they likely wouldn't have produced much more bud than they did here. Any extra time spent in the vegetative stage likely would have been a waste of time. This was the longest solid cola I've gotten from a 250W HPS grow light; it was about 12" long. Below that point the plant still made buds, but they were individual buds as opposed to a long cola. The final height of a plant should generally be about twice the height of your longest main cola. That tends to be the "sweet spot" for a lot of strains. If nothing else was changed, the yields would not be that different whether the plant is 2 feet tall or 4 feet tall under a 250W HPS, because the light just doesn't go down that far into the plant. However, a bigger grow light could have supported a taller plant. How Much Taller Will My Plants Be After Switching to the Flowering Stage? A too-tall plant isn't a big deal if it actually fits in your grow space, but the extra lower growth that doesn't produce bud is essentially a waste of electricity, time and money, since you potentially could have shaved weeks off your vegetative stage without sacrificing yields! Under a 600W HPS, I haven't ever seen a main cola that's much longer than 2 feet even if light is getting down almost to the floor. So, I'm not sure how much benefit you would get by switching to 12/12 after the plant is 2 feet tall. These plants were switched at around 20" tall under a 600W. You can support even taller plants and longer colas under bigger grow lights! Note: Always try to do an "autopsy" after you grow and take a hard look at your pictures to see if there's anything you could have done to get even better results! I learn something new every grow! 600W HPS – Switch when plant is ~21" tall. LED Grow Lights – Unfortunately this depends a lot on the model. It's partially a matter of trial and error because there's no "standard" with LEDs like there are with other grow lights. A good rule of thumb is to take note of the length of your main colas after the switch to 12/12 (from a previous grow), then try to initiate flowering with your new plants when they're about that height. 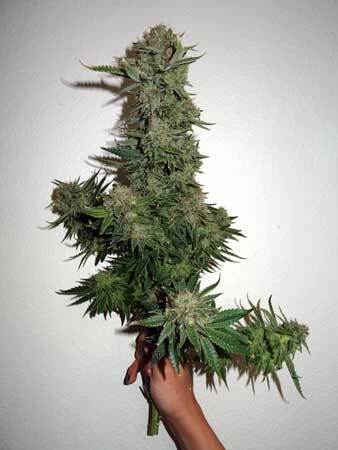 So, if your main colas end up around 12" long, initiate flowering when the plant is 12" tall, etc. But if you aren't sure yet, I recommend just sticking to the "half the final desired height" rule with LEDs, because that ensures that at least the plant will fit in your grow space and you'll be able to learn what to expect from your LED model. Note: Defoliation (removing leaves to expose bud sites) lets you produce bigger buds further down into the plant! 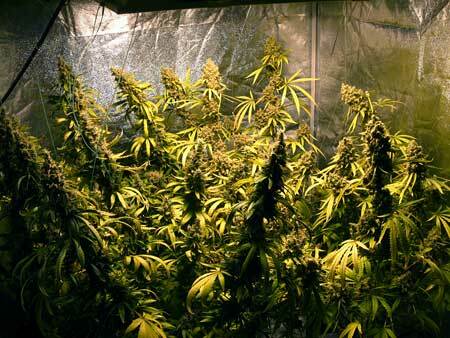 That means your light could potentially support slightly taller plants with longer buds if you use defoliation. This is why it's important to always test your plants with your light and your setup, as everyone's results will be a little different based on their strain, environment and personal growing techniques. Although plants typically double in height after the switch, some particularly tall and short strains can stretch more or less than average! Always pay attention to what the breeder tells you about your strain and plan accordingly! With a "short" strain you should wait until the plant is taller before the switch (3/4 the final desired height), to ensure the plant is tall enough after it's done stretching. In the picture below, the grower could probably have switched to 12/12 earlier without hurting yields because the buds at the bottom are not adding much weight. Sativa plants like this can triple in height after the switch to the flowering stage, so it's common to end up with a Sativa plant that's far taller than expected! Height restrictions are much different for outdoor plants which mature under the powerful light of the sun. Outdoors, plants can keep getting taller and taller as long as they get enough direct sunlight a day and have enough root space. Root space is more important outside and with soil than indoors or with coco or hydro. Root space for outdoor plants is usually provided with big fabric pots (600+ gallon containers in some cases!) or with raised beds full of good soil. 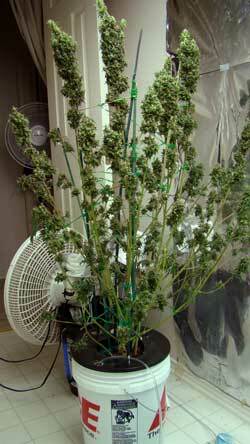 This plant got 12 feet tall in just one summer, with a 3+ foot cola at the top! It received 9+ hours of direct sunlight a day. Unlike an indoor grow light, the size of outdoor plants is limited by the root space and the number of hours of direct sunlight a day! So What's the Best Plant Height? Ultimately, there is no "right" or "best" height for a cannabis plant, and like most things when it comes to growing, it depends a lot on your setup. I've given you some general ideas of what to aim for and what to expect, but it's also very simplified. Unfortunately, there's no single formula that fits every growers setup. But the following pictures will hopefully help give you some ideas! 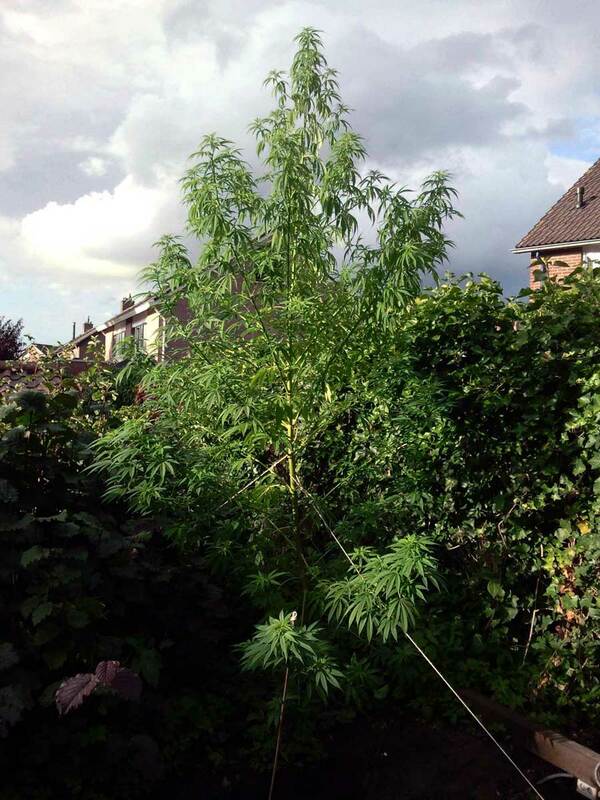 Check Out Examples of Cannabis Plants That Are Too Tall, Too Short, or Just Right! This marijuana plant got great yields for its size under a 600W grow light, but notice how the buds are thick all the way down. This is a clue that this plant likely would have produced more if it'd been allowed to get a little bigger before switching to the flowering stage – you can see the buds "want" to go down further than the bottom of the plant. Additionally, there is empty space behind and to the left side of the plant. If the plant had been trained to grow wider in the vegetative stage, those empty spots would be full of colas, too! In this example, the plant was "lollipopped" (the lower part of the plant was stripped of leaves and bud sites before being switched to the flowering stage). However, on the parts of the plant that weren't stripped, you can see significant buds going a lot further down. This plant likely would have yielded even more if it'd been allowed to keep more bud sites. The grower could have still stripped all the leaves, but they may have gotten better results if they'd left bud sites for at least a few more inches if not all the way to the bottom. Notice how small the buds are at the bottom of this next plant. If it had been allowed to get much taller it likely wouldn't have produced significantly more yields, but it would have taken extra time in the vegetative stage. 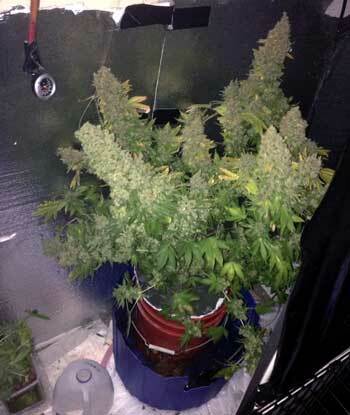 This is an example of what the plant should generally look at harvest like if it's the proper height – about twice the height of the big buds on top, with significant but small buds at the bottom! It could have been a little shorter and probably not lost any yield, but definitely an example of a good final height! Here's another example of a plant that was a good height at the end. You can see there isn't a whole lot of extra growth at the bottom with small buds. However, you can see the buds end where the thick layer of leaves begins. This grower could have used some light defoliation to expose more bud sites lower down, and produced buds further down into the plant. In that case, their grow light could possibly have supported a plant that was even taller! Another example of plants that were a great height at harvest! 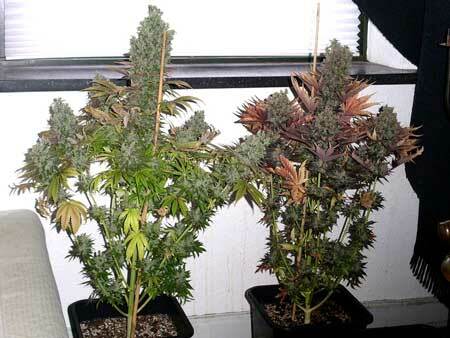 The optimal plant height before flowering is about the length of your "main" (solid) colas. For your first couple of grows, you'll have to guess (and I gave some guidelines above to help get you started), but after some experience with your setup you'll be able to dial it in perfectly every time as long as you do strain research first. Increasing overall plant size and number of bud sites in the vegetative stage (while staying the proper height) will increase number of colas and ultimately yields. Training the canopy to be flat, yet wide enough to fill the entire space under the light ensures all cola are a good distance to the grow light in the flowering stage. Letting plants get taller than your light can support will result in wasted time in the vegetative stage! 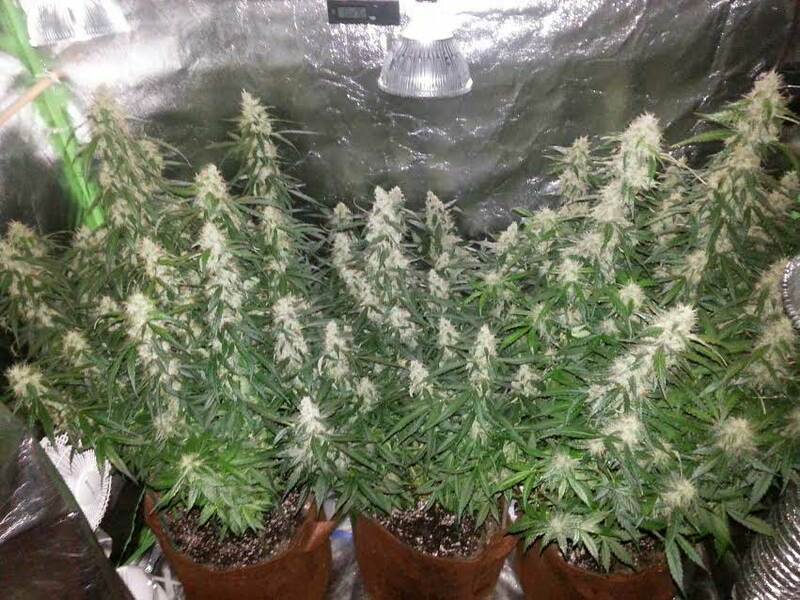 Defoliation lets you produce bigger buds further down into the plant by exposing more bud sites to light! Again, always try to do an "autopsy" after you grow and take a hard look at your pictures to see if there's anything you could have done to get even better results! I learn something new every grow! In addition to the height, the overall size/mass of the plant has a big effect on final yields. A bigger plant can simply support more and bigger colas. Because of that, it's good to build up overall plant size as opposed to just height to maximize yields. You want plants that are wide and flat like a table, not tall and skinny! Many indoor growers let their plants get bigger horizontally while restricting the plants' ability to grow taller than the grow light can support. This lets you keep adding more and more bud sites without letting the plants get too tall. In addition to making sure your plants are the proper height, you also want to train your plant canopy to be flat and wide before switching to the flowering stage. The best yields are achieved by filling the entire grow space front-to-back and left-to-right with a flat canopy because it lets all the buds be close to the grow light. Maximize your yields by filling your grow space with colas!